This page started based on the Messerschmitt Me-262A1b, a rare derivative powered by a pair of BMW 003 engines which are made in resin by Lone Wulf models in 1/72 for either the Matchbox, Revell or Hasagawa kits. The BMW 003s were the original engines for the new Me-262 V1 Schwalbe, but during initial flights flamed out or, due to poor metallurgy﻿, stator blades broke off and were sucked into the engine. Luckily for the pilot, the Junkers Jumo piston engine was still in the test airframe for a safe landing. At this point the Junkers Jumo 004 engines were developed, but were significantly heavier than the BMW 003s, however, the decision was to continue with these. After successful testing, the airfame had to be revised for the heavier engines, thus the overwhelming majority of Me-262s, designated A1a, were powered by a pair of Junkers Jumo 004s. On Hitler's insistance a majority of airframes were manufactured to carry bombs and this version was known as the Sturmvogel, an initial jet-powered fighter-bomber combination. Matchbox Messerschmitt Me-262A1a in 1/72. Model and photo by Zane R Nobbs. However, as Germany's war situation worsened, any and all variations were approached including a few Messerschmitt Me-262A1b models. These were not the version with the BMW 003 rocket-assisted engines, but the straight BMW 003. Along the way, as things began to reverse significantly on the Russian Front, the Furher eventually allowed aircraft for the Russian Liberation Army (Русская Oсвободительная Aрмия﻿ - POA) formed originally as a propoganda unit of volunteers captured from the Soviet armed forces to liberate Russia from Stalin and the Bolsheviks. Later these divisions were expanded to nearly 1 million service personnel including an POA air division. Documentation suggests (not verified) that at least one and possibly two Me-262A1as were alloted to the POA Air Force in February 1945, and near the end of the war Himmler even advocated formation of a Ukrainian flighter unit. Messerschmitt Me-262A1a POA, Hasagawa 1/72. Model and photo by Zane R Nobbs. Beside these developments the Me-262 inspired other aircraft for Japan. 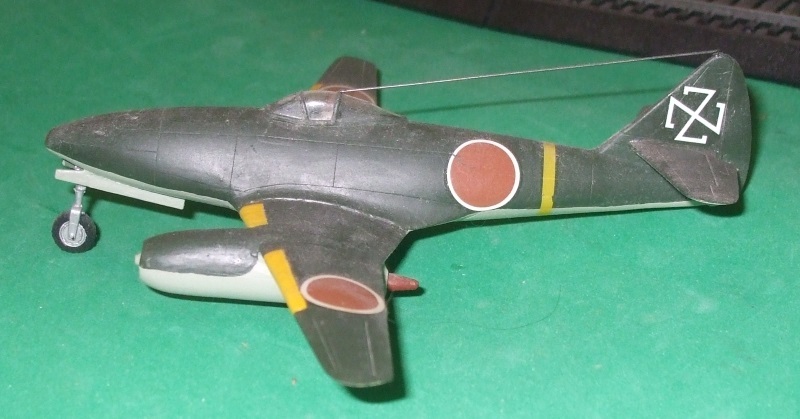 During the war an Imperial Japanese Army officer was privy to development of the Me-262 leading to an airframe and technical data being sent to Japan by submarine. The submarine with the airframe was sunk en route, however, the technical data was successfully delivered leading to two projects by Nakajima. The first of these was the Nakajima (J9N1) Kikka (中島 橘花 - ﻿Orange Blossom) for the Imperial Japanese Navy modeled on the Me-262 with engines derived from the Junkers Jumo 004, but significantly smaller. This aircraft was designed, built and flown in 1945, just prior to the conclusion of WWII. Similar to Hitler's idea for the Me-262 to be a fighter-bomber (Sturmvogel), the first Kikkas were designed as bombers or attack (suicide) aircraft. Fighter versions were planned. The second project undertaken by Nakajima was the Nakajima Ki-201 Karyu (中島- ﻿Dragon Slayer) for the Imperial Japanese Army. This aircraft had more powerful engines on par with the Junkers Jumo 004s and had reached about 3/4 construction by the end of the war. It was intended to fly in October/November of 1945. Nakajima Ki-201 Karyu by RS Models in 1/72. Model and photo by Zane R Nobbs. The Karyu was much larger than the Kikka and slightly larger than the Me-262, but retained the same layout. Performance would have been superior to the Kikka and at least as good as the Schwalbe. Nakajima Ki-201 Karyu and Nakajima J9n1 Kikka compared. Models and photo by Zane R Nobbs. Even before the end of hostilities the Schwalbe is said to have inspired yet another aircraft, that being the Soviet Sukhoi Su-9K (Самолет К - Aircraft K) ﻿[NATO Code: Type 8] powered by a pair of captured Junkers Jumo 004 engines. The Su-9K was started in 1944 at the insistance of Stalin to come up with a counter to the Me-262. Though the cross section of the airframe more closely resembles the American Bell P-39 Cobra, many of which were sent to the Soviet Union, Stalin was discouraged from mass production of the Su-9K by Yakovlev's suggestion that is too closely resembled the Me-262. Sukhoi Su-9K Самолет К (Aircraft K)﻿ in 1/72 from Victoria Models. Model and photo by Zane R Nobbs. Post-war the Me-262 received a new lease-on-life when in Czechoslovakia it was discovered that a German Me-262 construction site was still intact. Spare parts were gathered up and the assembly line reconstructed to build several Avia S-92 Turbína﻿s (Turbines) powered by Junkers Jumo 004s. Avia also tested a version powered by the BMW 003, but reverted back to the Junkers Jumo 004s. Avia S-92 Turbina of the Czechoslovakian Air Force in 1/72 by Hasagawa. Model and photo by Zane R Nobbs. Avia S-92s equipped at least one unit for the reconstituted Czechoslovakian Air Force and were also used as civilan aircraft for the Czechoslovakian Air Police. In an effort to revive it's indigenous aviation industry, Czechoslovakia also negotiated to provide Yugolavia with the S-92 Турбине﻿ (Turbína﻿﻿), designating two airframes, however, as the Soviet Union exterted pressure, this was discouraged from taking place so that the Russians had markets for their MiG-15s, Yak-23s and others. Авиа С-92 Турбина﻿ (Avia S-92 Turbína﻿) prototype for the Yugoslavian Air Force in 1/72 from Hasagawa. Model and photo by Zane R Nobbs. Undeterred, Czechoslovakia continued on with the Avia S-92 Turbína﻿﻿ for as long as they could into the 1950s. In another bid for foreign customers, there are unconfirmed reports that once Israel had established independence, one to three Avia S-92s were sprited there as test aircraft. One was said to have been destroyed with the other two either being stored or cut up for scrap. This instance has yet to be verified. אביה ס- 92 טורבינה﻿ (Avia S-92 Turbína﻿) ﻿prototype for the Israeli Defence Force in 1/72 by Hasagawa. Model and photo by Zane R Nobbs. Thus the world's first commissioned combat jet aircraft not only survived the conflict for which it was built, but went on to serve well beyond that point. 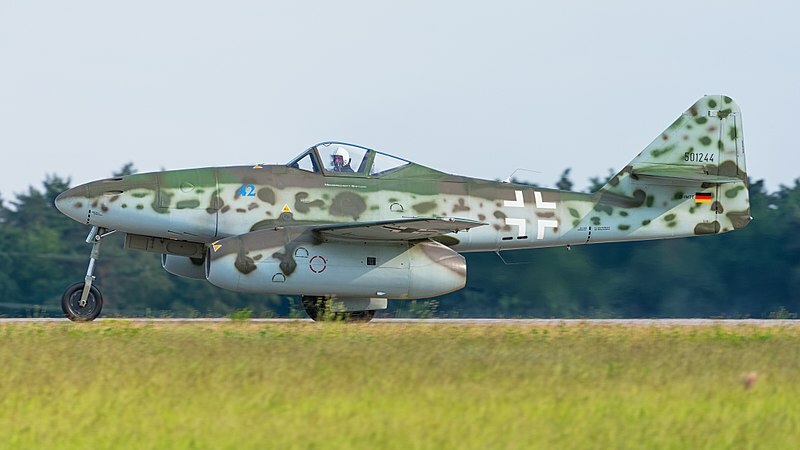 In fact, today replicas of the Me-262 have been resumed by a company in Texas, The Me-262 Project, for both historical purposes and for those who want and can afford a very historically accurate replica. The exception is that the real, modern turbojets are contained within an external housing based on the appearance of the Junkers Jumo 004 turbojet. Messerschmitt Me-262 Schwalbe built by the Me-262 Project. Photo by Julian Herzog.